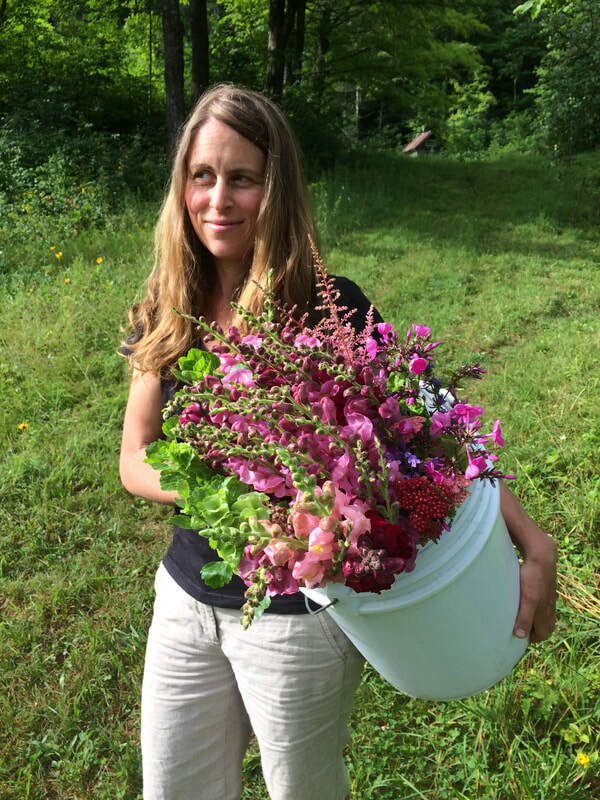 Rock Meadow Farm is owned and operated by myself, Betsy Orvis, a native Vermonter whose roots run deep in the hills of South Starksboro. A lifelong gardener, I developed a love of flowers as a child, and as a young adult working in my parents' flower shop. It was there that I learned proper cut flower handling and the foundations of floral design. I came to know and love the rhythms of farming while in college, studying plant and soil science and working on a small organic farm in rural Vermont. Growing cut flowers on the farm united my passion for tending plants with creating beautiful bouquets. I met my husband through farming, and we moved into an 1800's homestead in Hinesburg, or "the ends of the earth - Chittenden County", in the words of my Grandma, who was indeed a lifelong Addison County gal! After years spent reclaiming old gardens and creating new ones, renovating our home and raising a family, and focusing attention on the subtleties of the land, I feel gratitude and a deep connectedness to my hillside home. ​Since it's inception, Rock Meadow Farm has outgrown the gardens and greenhouse space here at home, and I now lease the dreamiest river bottom soil at Jubilee Farm, located in Huntington Center. It's thrilling to be back in the community where, 20 years ago, my farming journey began. ​Rock Meadow Farm was born of my desire to get back into small scale agriculture after the birth of my two children, now 8 and 10 years old. The name pays tribute to the original settlers of this land and its bony soil...to the quintessential rock piles created in open meadows, handpicked from the plowed earth to make way for homestead gardens. My love of farming is focused on flowers, and I am honored to share their beauty and brightness with my community.